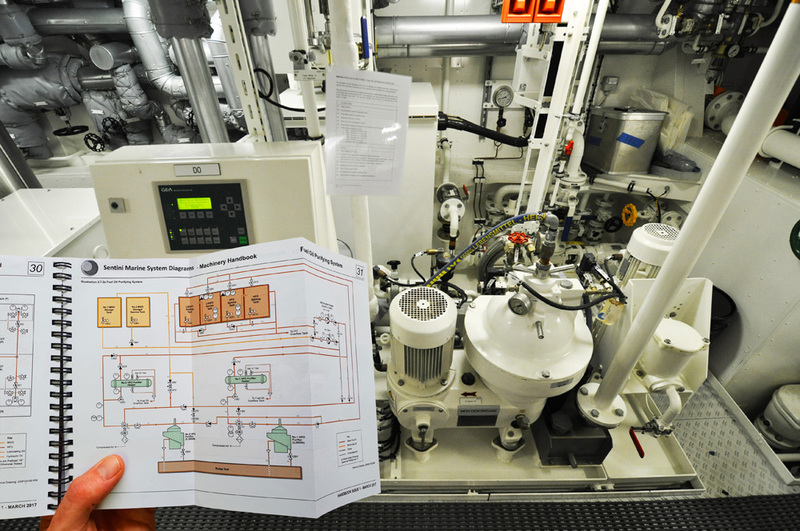 With the ever-increasing complexity and automation within the superyacht engine room, the necessity for high quality operating manuals has become more apparent. and yacht industries, they noticed that, unusually, yachting is way behind in standards and quality. They therefore formed a partnership with WMT to bridge that gap. For 25 years, WMT Marine has been developing operating procedures for the marine industry and their manuals are used by all the major players worldwide (Carnival, RCCL, NCL, BP, Maersk, and, most recently, Lürssen).The client list includes nearly all the major shipping companies and shipyards across the globe. Clients rely on these manuals because their combined expertise is focused on quality, yacht-specific and fit-for-purpose documentation, providing in-depth knowledge to crew on board as well as management ashore, resulting in increased safety, efficiency, less down time and greater reliability on board their vessels. The technical manuals Sentini Marine is supplying into the yacht market are the result of highly trained and experienced professionals. These authors include Master Mariners, Chief Engineers, Chief Officers, Deck Officers and ETOs, so between Sentini and WMT, they not only understand the operator’s requirements for the best manuals, but will also offer technical and professional support throughout the project’s lifetime. The operating procedures also include input from the system designers to ensure that the vessel is operated as it was designed to. Why do yachts need bespoke, vessel-specific operating manuals? With today’s increasingly complex and automated vessels, yacht crew and yacht management are finding it necessary to have access to clear, concise and up-to-date operating instructions. User-friendly and bespoke operating procedures create the optimum working environment which will, in turn, prevent accidents and incidents during operations, whilst maximising efficiency up time and vessel availability to the owners and charterers. Operating manuals must be a maintainable ‘one-stop’ source of information, which will appeal to different user groups, comprising user-friendly levels of information, reinforced by bespoke illustrations and drawings. Owning quality documentation that can be easily forwarded to the shipyard before repair or refit, and then updated to reflect changes to the vessel and its systems, will aid preparation for work to be carried out, as well as ensure continued smooth operation and maintenance of the vessel. Documentation updated in a diligent manner will ensure that your vessel always has a unified set of up-to-date instructions, illustrations and drawings.